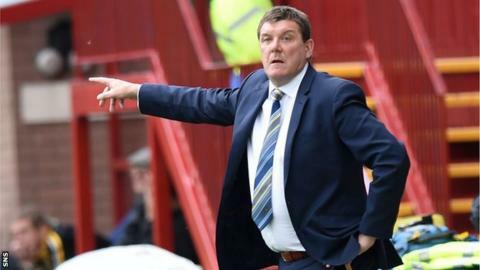 St Johnstone manager Tommy Wright admitted his side we fortunate to take all three points from their 2-1 win against Motherwell. Brian Graham scored the only goal of the match when he headed in with just four minutes of the match remaining. "It was a tough game," said Wright. "Our crossing wasn't great. "But Gary McDonald put in a great ball for Brian Graham and we got the winner. Overall, I think we just about shaded it." The win keeps St Johnstone in the top half of the Premiership table in fourth place with nine points, after Graham came on as a second-half substitute to score. Wright singled out the 26-year-old loan player from Dundee United for individual praise after his side were able to hold out and secure all three points. "He's got a decent record," said Wright. "He's a confident lad - he's scored goals at all sorts of levels and he's had a dream start - long may it continue. St Johnstone are now only one point away from the goal set by Wright at the start of the season as he bids to mount a successful challenge at the higher end of the top-flight and he said his players deserve the up-coming international break. "We set these little targets, and early in the season you want your first win and the next one is getting 10 points," said Wright. "We can enjoy the international break now and there's a few boys who need a break, so we'll recuperate and get ready for Dundee on the 13th."